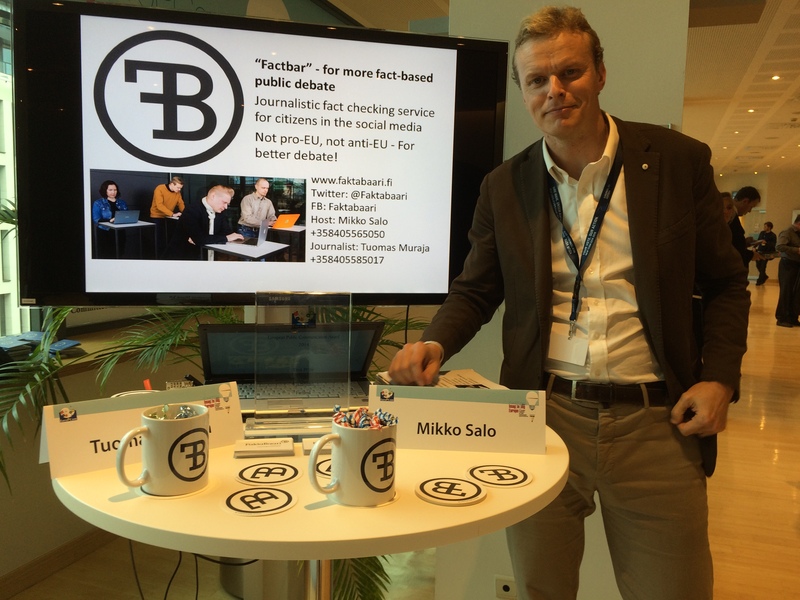 Faktabaari is a Finnish factchecking service bringing accuracy to the public election debates. Faktabaari is a non-partisan journalistic service using social media for collecting and distributing factual information with crowds.Faktabaari comes from the Finnish words for fact (fakta) and bar (baari). Faktabaari started by serving facts on common misconceptions on EU and followed the public European election debate during 2014 in order to correct the factual mistakes to support a fact-based and informed public debate. Faktabaari is run by a transparency NGO called Avoin yhteiskunta ry (Open Society association, Finland) and is managed by a voluntary staff of professional journalists, researchers, EU experts, teachers and technical staff with the help of broader network of topical experts and information and media literacy specialists. The independent international branch (FactBar) is connected to the European debate by co-operating with a network of like-minded partners. 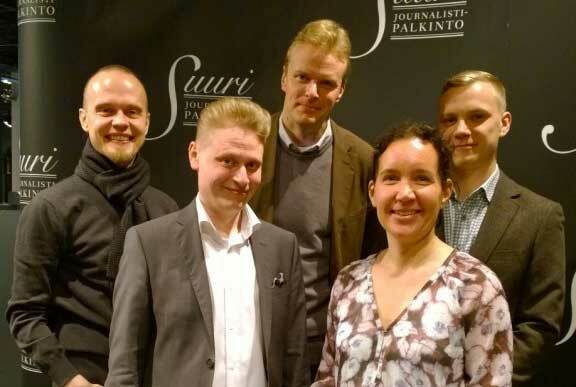 Faktabaari won the award for the Best Journalism Act in the 2014 Finnish Bonnier journalism awards organized in March 2015. The European Public Communication Award 2014 was attributed to Faktabaari at the EuroPCom 2014 Conference in Brussels. Some results about the first pro-bono 2014 European Parliament election project can be found from the blog posting. Faktabaari ran a fact-checking campaign also on the Finnish 2015 parliamentary elections. The campaign was made possible by a €59,000 grant awarded to Faktabaari by the Helsingin Sanomat Foundation in September 2014 and €10 000 discretionary grant from Government’s Europe information 2014 and 2015 to our transparency NGO – Avoin yhteiskunta ry. In March 2015, Faktabaari won €30,000 of seed money in the Media innovation competition organized by the Finnish Ministry of Transport and Communications. Currently Faktabaari staff is involved with e.g. a European project FactBar EDU open for European members of emerging global fact-checking community and cooperates with it’s sister project Debattibaari (DebateBar) – for argumented public debate – while covering the fact-checking campaigns on national elections. After thematic fact-checking projects, Faktabaari piloted April 2017 a successful crowdfunding project (about 15 000 EUR) enabling an intensive Municipal election campaign including an innovative media literacy project for future voters – Faktabaari EDU. Faktabaari EDU was shortlisted as finalist to Evens foundation Media Literacy Award 2017 and to present the case in Sarajevo major Media meets literacy seminar.. Faktabaari EDU has received funding (7500 EUR) from Alfred Kordelin Foundation. January 2018 Faktabaari current desk with the support of the development group both fact-checked and consulted professional journalists to fact-check Finnish Presidential elections including new succesful medialiteracy pilots while organizing two major events where University researchers helped live fact-check the main election debates. After presidential elections Faktabaari evaluated the transparency of all the fact-checks and made related recommendations. Faktabaari Mikko Salo is a member of the independent EU High-Level Expert Group on Fake News that has issued March 2018 EU commission a recommendation for “Multidimensional approach to disinformation”. Faktabaari is committed to developing Finnish fact-checking and related media and information literacy efforts as civil society driven meeting place for people concerned on fact-based public debate in digital age. Faktabaari prepares eg. to contribute for more fact-based 2019 European elections as part of European network of fact checkers. Faktabaari unique cybersecure publishing platform is based on advanced open source coding and we use creative commons licence for publishing. Faktabaari independent spin-off FactBar shares especially digital media literacy relevant information on European fact-checking networks for fact-based public European elections debate. For further information and recent activities in English please contact mikko(at)factbar.eu or follow twitter.com/factbar and soon also facebook.com/factbar.